One single word best sums up human behaviour over the past 150 years: consumption. And the unbridled frenzy with which humankind has come to need newer things at a quicker pace has found its ultimate expression in the mall. The mall concept was invented in Europe in the late 19th century - in the form of shopping arcades - and has evolved to become the huge complexes that we see today. In &quot;Mega Malls&quot;, we see that the mall has become a place where we can satisfy even the most insignificant of our needs, and for many years now this has involved much more than simply supplying ourselves with food or any other item imaginable. 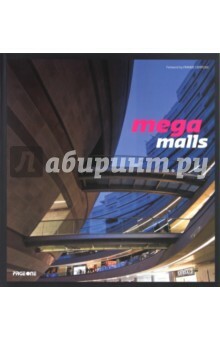 As shown in the variety of projects selected in this compilation - chosen from among the most impressive shopping centres in the world - the mall has become a place offering shopping and entertainment in equal doses. Through the full-coloured images and illustrations in &quot;Mega Malls&quot;, it is not hard to see how malls have become an all-encompassing feature in our lives. Литература на английском языке.